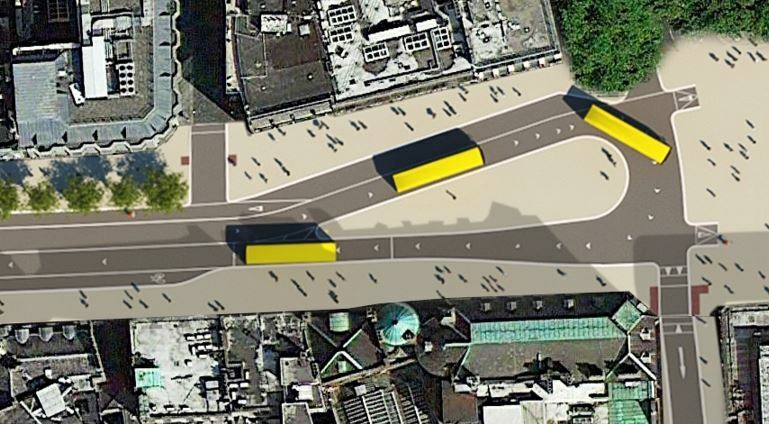 Public consultation and media reports covering the College Green Plaza project highlight a segregated cycle path between Trinity College Dublin and the Bank of Ireland, but major questions remain as to what it will connect to and how people cycling will get around the area. The issue of what the two-way cycle path will link to in a number of directions, and the quality of these links, is not revealed in public consultation documents released on Monday. While groups such as the Dublin Chamber of Commerce have questioned a lack of details on bus and general traffic arrangements, the plans for cycling are far vaguer. 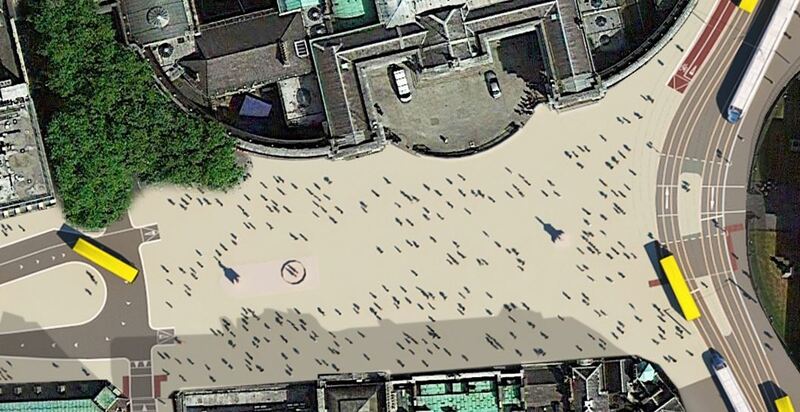 It is still unclear how people cycling will get from the two-way cycle path on College Green across the plaza to Dame Street — we are told the route is to be designed in a separate process, which will also include the detailed design of the plaza. Council officials and some councillors have mentioned a ‘cycle path’ or ‘cycle lane’ across the plaza, but the consultation report makes no firm reference to such. It is is also unclear what, if any, and of what quality, cycling links there will be between College Green and a range of locations, such as the quays, Dawson Street and Nassau Street, and College Street. Dublin City Council has a long history of compromising on the quality of cycle routes. For example, recently we reported how residents and commuters outlined the faults of the civic space scheme outside Kilmainham Gaol. The project was constructed for the 1916 celebrations, but people who cycle in the area said that the design made a bad situation worse for cycling. Councillors have mostly stayed quiet on the issue. 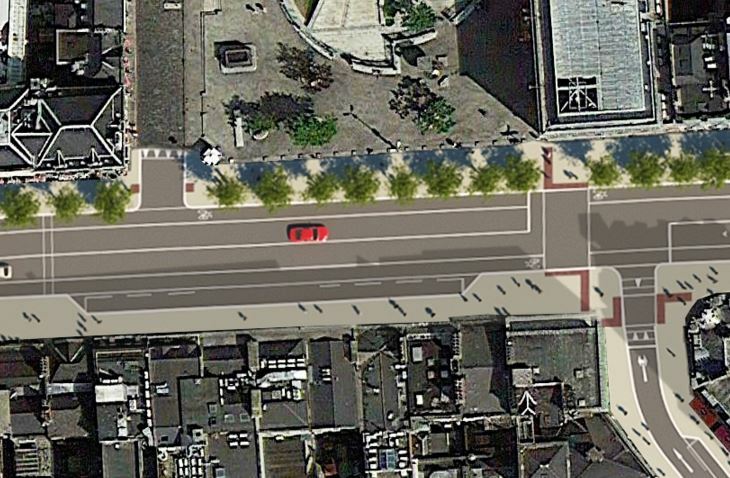 What the drawings issued with the public consultation show is the mixing of buses and bicycles on Dame Street; no contra-flow cycle paths or lanes on the streets south of Dame Street; and no two-way cycle path on College Street (which was accommodated in previous plans for College Street under the BRT to Swords). 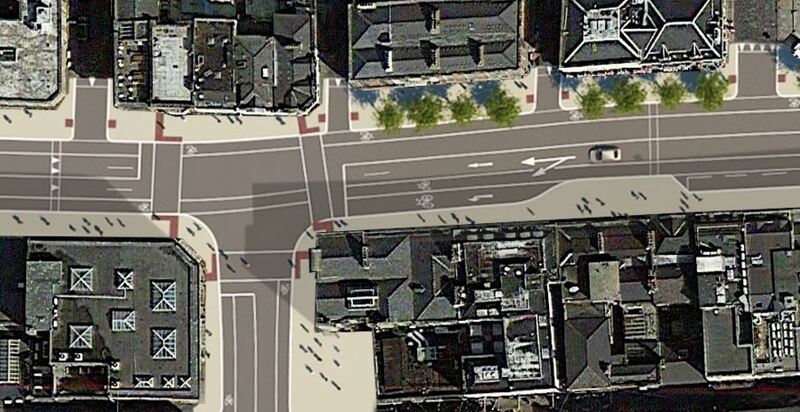 Despite the detour of most buses on Dame Street and also the removal of a large left turning lane on the street, the current Dublin City Council plan for the street includes mixing cycle lanes with bus stops rather than including segregated cycle paths. 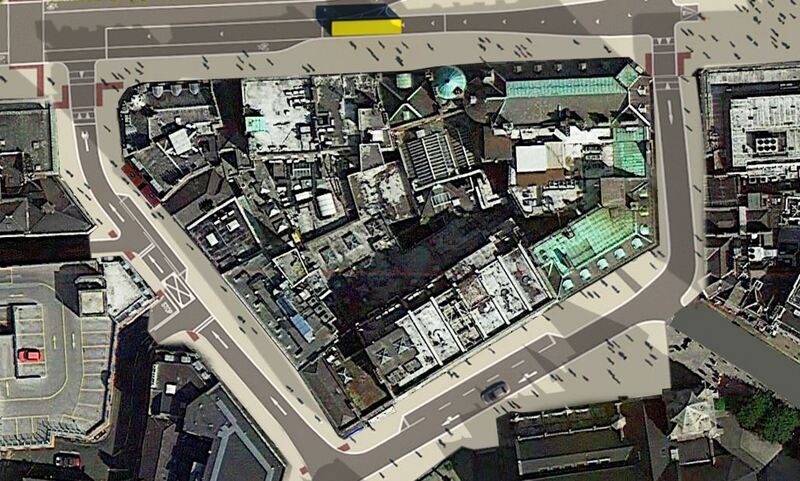 Submissions for the public consultation on the College Green Plaza can be made by email to: traffic@dublincity.ie on or before Tuesday May 26, 2016. A report and other overview details can be found at dublincity.ie/college-green. 1) Banning cars? Yes – there are plenty of alternatives available. 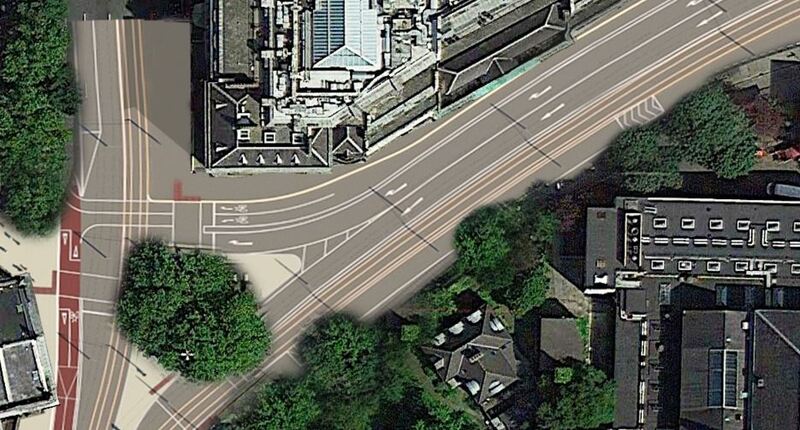 2) Banning buses from going through (to and from Dame Street)? Not so sure where they would go – also what about the Lucan Luas and the possibility of extending it to the South Docks? 3) Allowing cycling on the plaza? No – you either have a pedestrian plaza or you don’t. There will be a pedestrian plaza with a cycle path to one side of it. How exactly is that so hard to picture? My primary concern would be how a bus and tram would operate on the same section of road, as illustrated in the first image! @dp — buses and trams sharing works elsewhere. Although usualy with shared stops or no stops — not with bus bay stops in confined spaces.